Chabad at UC - UConnect! We know being far away is tough for parents, so Chabad offers to help with our UConnect packages delivered to your child six times per year. Simply make your selection below, remember to include in the "Note to Seller" box your child's name, cell number and mailing address, and we'll personally deliver these holiday and care packages throughout their college career at UC - even during their semester abroad! Click here to select two semesters of care packages for your son or daughter! That's SIX packages in total - even if they are out of the country! 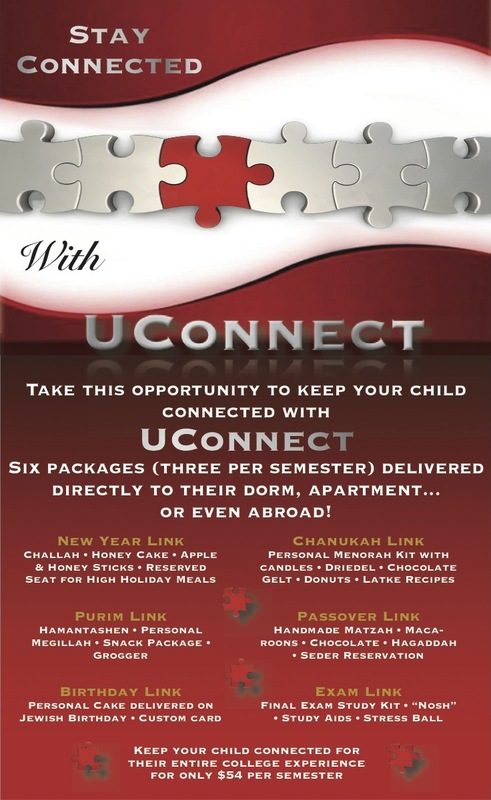 We know being far away is tough for parents, so Chabad offers to help with our UConnect packages delivered to your child three times this semester. Join our weekly mailing list!